Big luxury off-roader gets a raft of upgrades to keep it up to date. These days Lexus makes a whole range of SUVs and crossovers, but back in the day there was only one: the LX. Essentially a rebadged version of the Toyota Land Cruiser, the LX was and remains a leather-lined beast of a truck. Now Lexus has given it a bit of an update. The facelift centers primarily around the exterior, which has been updated with its own version of the company&apos;s new "spindle" grille design. The interior, however, has also been enhanced with some mahogany wood trim and a new multimedia system. In addition to iPod, Bluetooth and USB connectivity, the LX now includes high-def radio and Lexus Enform 2.0 information system. The rest carries over essentially unchanged, including the monstrous 5.7-liter V8 engine driving all four wheels with a Torsen limited-slip locking center differential. 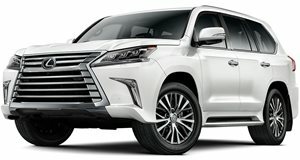 The updated LX570 does, however, benefit from a new off-road Crawl Control system that helps it traverse particularly tricky terrain at low speed, a new Turn Assist system that helps reduce the vehicle&apos;s enormous turning circle by braking the inside wheel and a five-mode terrain select system.